Irish Heartbeat is the eighteenth studio album by Northern Irish singer-songwriter Van Morrison and is a collaboration with the traditional Irish musical group The Chieftains, released in 1988. The album was recorded at Windmill Lane Studios in Dublin, Ireland and reached number 18 in the UK album charts. The album was recorded on dates from September to December 1987 and in January 1988. The Chieftains and Van Morrison had met years before at the Edinburgh rock festival. They joined up in Belfast during Morrison’s No Guru tour and afterwards, Morrison and Paddy Moloney discussed recording an album together during a walk. They each had a list of songs and reached a consensus to cover two of Morrison’s previously released tracks (the title track was one) and the rest from traditional Irish songs. I think at that time Van was searching for his Irish roots. It was this man of blues, of rock ‘n’ roll, jazz and more importantly soul, coming home to his Irishness with The Chieftains and the music we’d been playing for so many years. Musically we were going to meet each other half way. In October 1987 they performed together at Balmoral Studio in Belfast. The concert was broadcast on St. Patrick’s Day in 1988. Here is a great show from Ulster Hall, Belfast. The Chieftains : Paddy Maloney, Matt Molloy, Kevin Conneff, Sean Keane and Martin Fay. 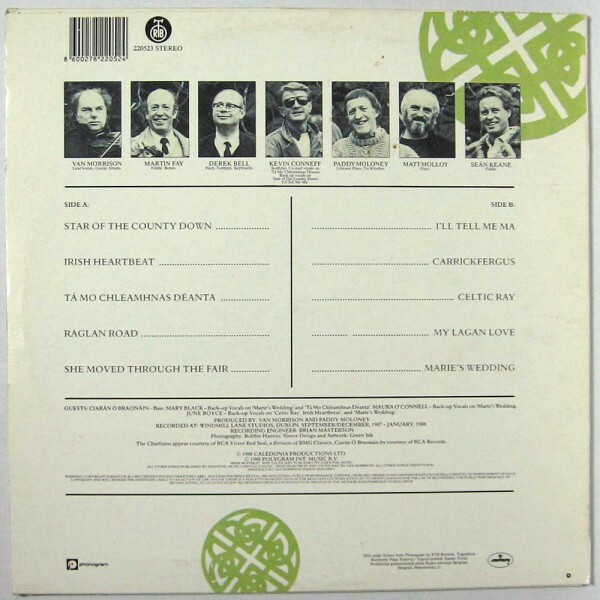 The album consists of eight traditional Irish songs, plus re-workings of the Morrison songs “Celtic Ray” (which first appeared on 1982’s Beautiful Vision) and the title track “Irish Heartbeat” (which first appeared on 1983’s Inarticulate Speech of the Heart). “Carrickfergus” is described as “a melancholic air worthy of Otis Redding” by critic Denis Campbell. “on Raglan Road” was adapted from a poem by Patrick Kavanagh and is the story of “a man ensnared by a beautiful revenant whom he had mistaken for ‘a creature made of clay’.” In 1994, Billy Connolly recorded a live cover of the song “Irish Heartbeat” during his World Tour of Scotland. The performance was used as the closing theme to the BBC series.